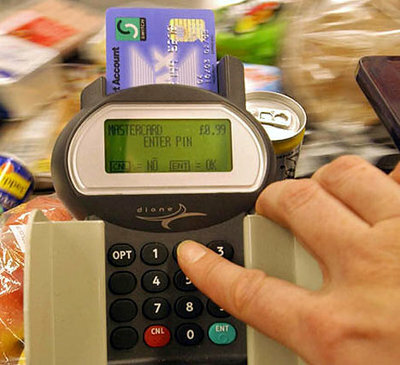 Where to get a chip and pin card? Chip and Pin. It sounds like a combination of french fries and needles. Technically it's the way most of Europe pays for things on credit cards. Worse yet, America doesn't have it. Worse yet, getting stuck on the Brussels Metro with one of their stupid unmanned kiosks mocking me telling me to be "Patienze" then telling me my American money is worthless. See there's a couple things I wish I would have taken with me to Europe. I did good with taking a mobile phone. (check) But I really should have sprung for some boots.... (it's like a national law there) and I wish somehow, someway I could have come up with a chip and pin credit card. I'll be honest I didn't understand the whole deal completely till Smiler sat me down in the living room of his home and gave me the 411 (118 in the UK :) ) See the U.K, unlike America has signature-less credit and debit cards with microchips that allow the "pin" to sign for the user. While the old magnetic slider cards we have in the U.S. are supposed to still be accepted in the U.K. and mainland Europe, I found that's not always the case... for instance... In Brussels, where the computerized kiosks give you two options, cash or card. My American debit/credit card is useless despite any which way you try to insert it into the slot, (believe me, I got creative) or what foul language you use- so that leaves cash. Except most Americans get their Euros (or Pounds) from the ATM which (I've never seen one that shoots out coins) spews notes that unfortunately don't work in the kiosk. I'm told many self-serve gas stations have left tourists stranded. Fortunately Brussels doesn't really care and you can still walk on to the Metro. We dug up the 1.50€ for a single jump (all we had in our pockets) and prayed one of us didn't get busted by the random checks they do. We made it safe down to Stockel where lovely Sarah helped us out with her chip and pin card. I will admit I was aware of this before I went. I wasn't exactly sure how it all worked and had considered borrowing a card with a U.S. chip. I didn't, and it wouldn't have mattered because here to find out it's not compatible anyways. It continued to be a problem not having chip and pin. Try having a conversation with the guy at Harry Ramadan's fish and chips about chips and pins? Gets confusing. At one point in a French Supermarche in Paris we were refused goods because the merchant couldn't figure out the "old" swipe technology. This occurred several other times, and it became apparent that the situation was much worse than in previous years when I was barely even aware of the issue and you can really carry only so much cash before you scare yourself. Eventually it's going to reach a point where American credit cards are worthless, and unusable in the rest of the world. Unfortunately to my knowledge there isn't a work around, though one may be on it's way. Till then I'm going to go order some boots and dream about fish and chips and a place where I have an unlimited balance credit card to go shopping. Update: Travelex, now offers chip and pin cards in America. I used one on my last vacation to Cairo and Brussels, and it worked brilliantly! Just picked it up at the airport. (Save your receipt though as they'll credit the refund when you return.) Also, my local credit union, North Carolina State Employees' Credit Union, has converted to chip and pin, which is Awesome. Keep nagging your bank, if they don't offer it- because apparently some are listening.